The Falcon Leader is launched at Bath Iron Works. Falcon Leader, a 666-foot oil tanker. BIW, invited the public to at- tend the launching ceremony. Deborah, was maid of honor. Sealift Command for five years with options for up to five addi- tional years. Affairs for the U.S. Department of Commerce, also spoke at the launching ceremony. The Falcon Leader is the first commercial ship built by BIW since it delivered the container- ship S/S Resolute in February of 1980. The modern tanker, fea- turing advanced environmental and safety systems, will displace 34,500 tons fully loaded and will have a carrying capacity of 225,- 000 barrels. The boat will be used to survey ship slips, take soundings, and monitor dredging operations in the N.Y.-N.J. harbor. Designed by Thomas Marine, Inc., the boat is powered by a Perkins model 4-236, 85-hp diesel engine driv- ing a three-blade Federal propel- ler through a Borg-Warner gear. Thomas Marine-built keel coolers, and a dry exhaust system. It is designed for winter and summer use. 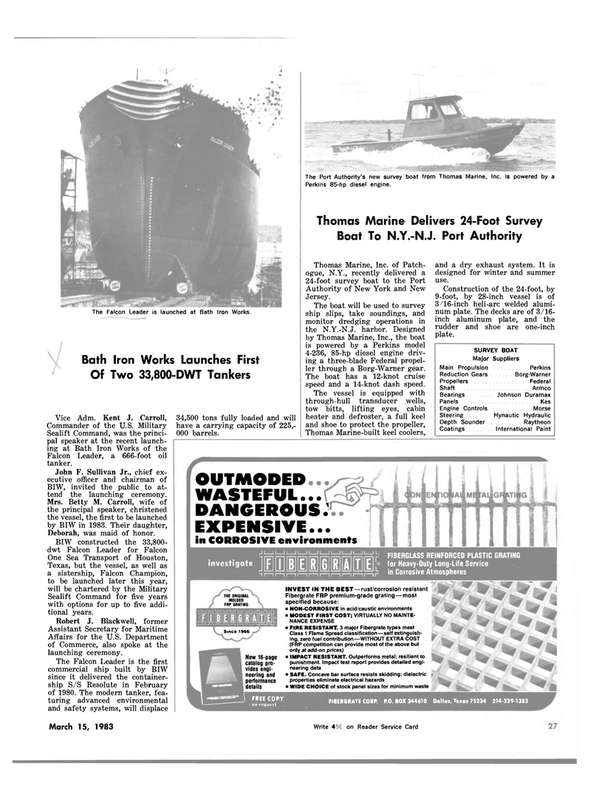 Construction of the 24-foot, by 9-foot, by 28-inch vessel is of 3/16-inch heli-arc welded alumi- num plate. The decks are of 3/16- inch aluminum plate, and the rudder and shoe are one-inch plate.